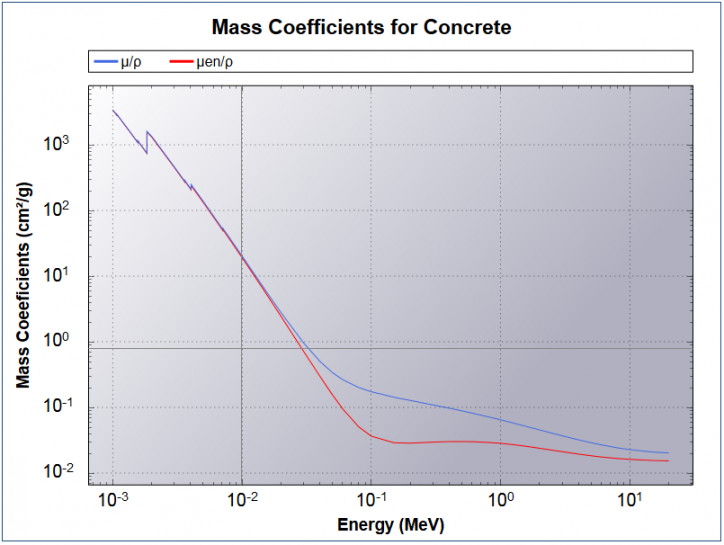 The Dosimetry & Shielding H*(10) has been further extended to include a new tab giving detailed information on the mass coefficients and buildup factors for a range of materials. The data is available in both graphical and tabular form. The list of shield entries, which has been extended to include 14 new materials, now consists of: Air, Aluminium, Argon, Beryllium, Boron, Calcium, Carbon, Concrete, Copper, Gadolinium, Iron, Lanthanum, Lead, Magnesium, Molybdenum, Nitrogen, Oxygen, Phosphorus, Potassium, Silicon, Sodium, sulfur, Tin, Tungsten, Uranium, Water. In 2016, we continued with our mission to build the most innovative technical resource for knowledge creation & competence preservation for the worldwide nuclear science community. Our vision is to provide scientists, engineers and technical personnel in the field the best software solutions and, in addition, create a sustainable home for the nuclear science community on the web. During the past year, we have again extensively upgraded and re-written a wide range of applications. In particular the following new applications have been created: Photon Dose Rate Constants, Radiological Converter, and Dosimetry & Shielding, H*(10). Pages 2-4 describe these new developments in more detail. 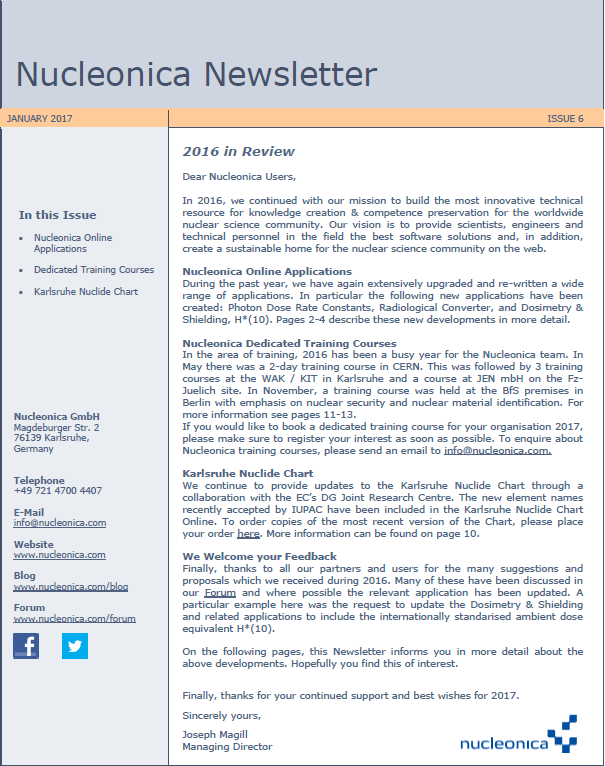 In the area of training, 2016 has been a busy year for the Nucleonica team. In May there was a 2-day training course in CERN. This was followed by 3 training courses at the WAK / KIT in Karlsruhe and a course at JEN mbH on the Fz-Juelich site. In November, a training course was held at the BfS premises in Berlin with emphasis on nuclear security and nuclear material identification. For more information see pages 11-13. If you would like to book a dedicated training course for your organisation 2017, please make sure to register your interest as soon as possible. To enquire about Nucleonica training courses, please send an email to info@nucleonica.com. We continue to provide updates to the Karlsruhe Nuclide Chart through a collaboration with the EC’s DG Joint Research Centre. The new element names recently accepted by IUPAC have been included in the Karlsruhe Nuclide Chart Online. To order copies of the most recent version of the Chart, please place your order here. More information can be found on page 10. Finally, thanks to all our partners and users for the many suggestions and proposals which we received during 2016. Many of these have been discussed in our Forum and where possible the relevant application has been updated. 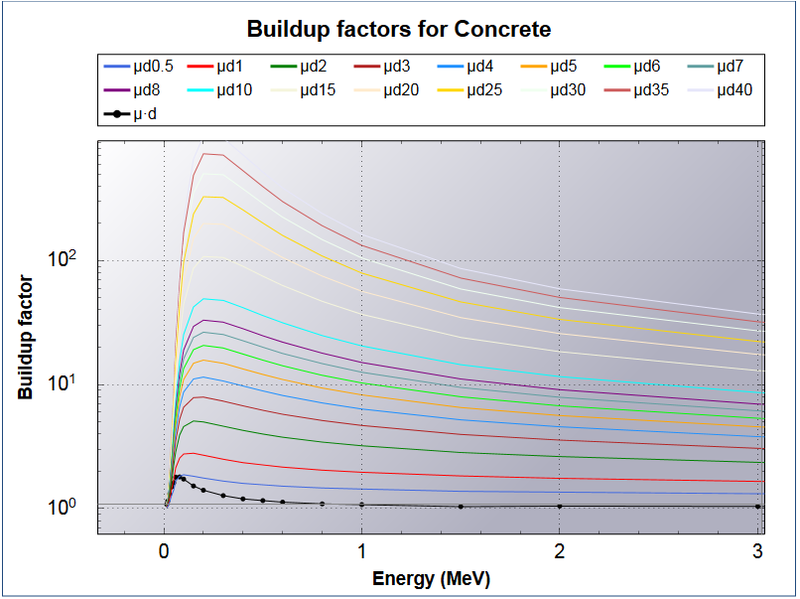 A particular example here was the request to update the Dosimetry & Shielding and related applications to include the internationally standarised ambient dose equivalent H*(10). On the following pages, this Newsletter informs you in more detail about the above developments. Hopefully you find this of interest. Finally, thanks for your continued support and best wishes for 2017.